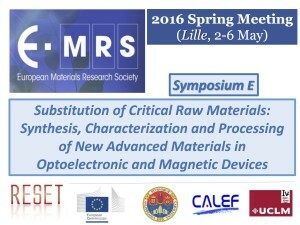 The Symposium aims to attract at the EMRS meeting experienced researcher as well as industries in the field of the substitution of critical raw materials in electronic and magnetic devices to increase the synergies in this community and help in the development of new efficient devices free from Critical Raw Materials. Raw materials are fundamental in most technological applications, however some of them are being recently defined by the EU commission as “critical” due to the high risk of supply shortage expected in the next 10 years and for their importance in the European Industry. The theme of Critical Raw Materials is fundamental to Europe’s economy, and their substitution or reduction is essential for maintaining and improving the quality of life and technologies. Different devices utilize nowadays compounds with CRMs as key elements, from lighting devices, (LED, OLED, CFL: Rare earths, like Ce, Y, Eu and Tb, In as CRMs), to optoelectronics, such as transparent conductive layers (In as CRM), permanent magnetic materials (in SmCo, NdFeB), catalytic converters, electrode catalysts in fuel cells (Pt group metals (PGM) and Rh-based catalysts) and rechargeable batteries (rare earths, graphite, Co, Li and Ni as CRMs). Research is needed to improve the fundamental understanding of the development of new material solutions with a reduced or completely eliminated critical content, while maintaining or enhancing the performance of the materials, components and products. The design of the alternatives compounds, the control of growth process coupled with accurate characterization are mandatory for further development of new CRM free devices. The symposium, organized by members of EIP RESET commitment, will provide an interdisciplinary platform to discuss about the alternatives to these materials from modelling, to the synthesis and processing up to their integration in the actual optoelectronic devices and hard magnets. Bringing together researchers from academia and industry we would increase the interactions among scientists, engineers, students working on different aspects in this field that too often are treated separately. Experimental research and computational modelling will provide complementary views and a unique opportunity in this challenge for a sustainable technological growth. The list will be further adjusted and integrated by invited talks selected from outstanding submitted oral contributions, preferentially chosen among younger Researchers.